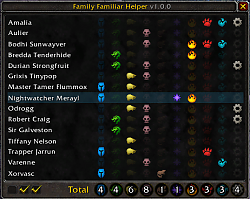 This addon's purpose is to make it easier to see at a glance which pet family has not been used for each tamer for the Family Familiar and Family Fighter battle pet achievements. Aquatic Acquiescence: Defeat 12 Master Tamers in Broken Isles with all Aquatic pets. Best of the Beasts: Defeat 12 Master Tamers in Broken Isles with all Beast pets. Mousing Around: Defeat 12 Master Tamers in Broken Isles with all Critter pets. Dragons! : Defeat 12 Master Tamers in Broken Isles with all Dragonkin pets. Ragnaros, Watch and Learn: Defeat 12 Master Tamers in Broken Isles with all Elemental pets. Flock Together: Defeat 12 Master Tamers in Broken Isles with all Flying pets. Murlocs, Harpies, and Wolvar, Oh My! : Defeat 12 Master Tamers in Broken Isles with all Humanoid pets. Master of Magic: Defeat 12 Master Tamers in Broken Isles with all Magic pets. Roboteer: Defeat 12 Master Tamers in Broken Isles with all Mechanical pets. The Lil' Necromancer: Defeat 12 Master Tamers in Broken Isles with all Undead pets. If you're keeping score, that means a minimum of 120 battles for Family Familiar and 180 battles for Family Fighter! Ouch! The default behavior of this addon is to summon its window when you target one of the candidates that qualify for either achievement. The tamers for Family Familiar are all part of world quests. The opponents for Family Fighter are up all the time. If you'd prefer to summon the window manually, you can turn off the automatic summoning through checkboxes at the bottomleft of the window. Mouseover each one to see what they do. You can also summon the window with the /ffh macro command or by setting up a key binding in the key binding interface. Once on screen, the window is a grid with tamers down the left in rows and pet families as columns on the right. 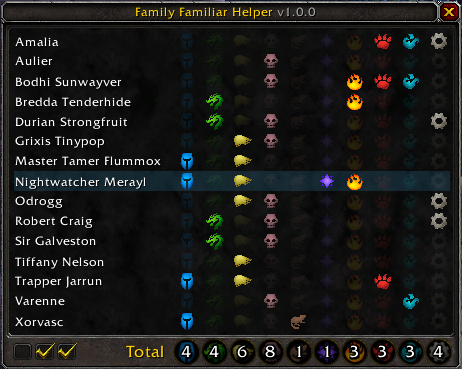 Along the bottom are the total tamers defeated with each pet family. The goal is to get at least 12 total for each pet family for Family Familiar and 18 for Famility Fighter. You can mouseover these totals to get a more familiar view of the achievement's progress. Special thanks to Flohsakk from warcraftpets.com for this addon's idea. If you have any questions, feedback or bugs to report, please post a comment here. Thanks! - If you were on an empty/"hidden" tab, then bringing up the window will switch to the original tab. - Fix for compatability with addons that remove tooltip backdrops, such as SpartanUI. - Updated for 7.3.5 patch and the new Family Brawler achievement. - Added LDB button to toggle the window. - If ElvUI enabled the window will lightly skin for it. - Reversed order of tabs so most recent achievement is on left. - Updated for 7.3 patch and the new Family Fighter achievement. - While on the 7.3 client, two tabs will appear at the bottom of the window to switch between Family Familiar and Family Fighter. - The green checks marking an achievement complete is now based on the achievement's completion status and not how many sub-achievements were finished. This should only be noticable by 7.3 PTR users: The PTR character copy seemed to copy the Family Familiar achievement but not the sub-achievements. So you may see green checks for totals while all pet types are blank. This is normal and should not happen on live servers. - The targeted tamer is now outlined in the window to make it easier to see which pet types are left for that tamer. - Made tooltip background solid for readability. - When 12 of a pet family are completed the number 12+ is replaced with a green check. - Raised frame to higher frame strata. I too want to thank you for putting this together for us. It is a great help with this achievement. I saw that this had been updated and so wanted to comment on it. If you're going for the Family Familiar achievement, this is a big help. Wowhead will tell you if any npcs are available that might help you along. This addon will then keep track of which you have encountered and so which you ought to look for next. If you have an excellent memory, you may not need this. If you do not and / or you like reminders and being sure, then this is definitely an addon for you. Nice work. It does something simple, but helpful, well. Edit: Now that I've read about the upcoming Family Fighter achievement, I'll be sure to keep this addon. Last edited by jlrm365 : 08-07-17 at 02:07 PM.